For 17 years, Dr. Cheung was a wait and watch patient diagnosed at the age of 56 with a growth in his brain that he described as a slowly ticking “time bomb”. This growth is an epidermoid brain tumor in the skull base, and a tumor at this location is as threatening as a “time bomb” with growing pressure on vital cranial nerves and structures. The 12 cranial nerves deep in the skull base perform all functions of the body from eating, walking, speaking, seeing, hearing, thinking/memory, and breathing. The skull base is a crowded and complicated area with openings that the spinal cord, many blood vessels, and nerves all pass through. Because this is such a difficult area to see and reach, skull base surgery was not done except in dire situations until the advance of technology. In the past, very few neurosurgeons operated in this small space. Trauma to any one of these cranial nerves is life changing and operating in the skull base location is still one of the most challenging surgeries. Dr. Cheung, knowing this, made the decision not to be treated, and decided to wait and watch. Dr. John S. Cheung had surgery for his epidermoid brain tumor on November 25, 2013, at National Neuroscience Institute in Singapore. His neurosurgeon, Wai-Hoe Ng, MD, is Deputy Director of the National Neuroscience Institute and Head and Senior Consultant at the Department of Neurosurgery (SGH and TTSH). He is also the Deputy Chair of the Neuroscience Academic Clinical Program and Associate Professor at Duke-NUS Graduate Medical School. The Duke-NUS Graduate Medical School Singapore (Duke-NUS) is a collaboration between the Duke University in North Carolina, United States and the National University of Singapore. Dr. Cheung has been a member of an epidermoid support organization for a lengthy time after being been diagnosed in 1996 in Singapore. He is currently a member of the Epidermoid Brain Tumor Society, joining the EBTS organization when it was first organized in 2012. Dr. Cheung has been a watch and wait patient and has mentored others during his years of membership with an epidermoid brain tumor organization. Recently, he undertook the endeavor of researching and writing about the epidermoid brain tumor and his way of coping as a wait and watch patient. To have brain surgery is a difficult decision if you realize that your life would change as before. In 1996, a decision to wait and watch was one of careful consideration and especially if you could live with symptoms. Epidermoid brain tumor patients know of cranial nerve deficits post-surgery and the lack of success in treating the brain tumor which is recurrent if not removed entirely. 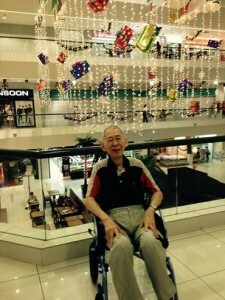 What they don’t know is how to deal with the situation of watch and wait, therefore Dr. Cheung’s insights into living and coping with a worsening condition is inspirational to others. His 2011 book titled, Surviving a Benign Brain Tumor; Professor Facing Retirement, Bereavement, and a Worsening Benign Brain Tumor All Alone is a heartfelt study of how a benign brain tumor can slowly affect’s one’s physical being and daily living. He felt that since the epidermoid brain tumor was such a rare brain tumor that his efforts would be read and appreciated by others who have been diagnosed with the same. In his book, Dr. Cheung writes a personal account leaving no stone unturned in order to be helpful and encouraging to others coping with a similar brain tumor. In his writing, he did emphasize that he felt alone and could not talk openly about his brain tumor as no one else actually knew much about this tumor and its effects. He kept quiet, until fortunately he found some help through an international email discussion group with others suffering the same tumor. He communicated with them and their caregivers with a list-serve, a relatively new internet service. As the years passed, the internet became more popular with patients seeking information. He gained from the experience of others, and he also gave helpful advice to those less knowledgeable. He commented on the way of facing this matter of living with a brain tumor, saying that he reduced his work pressure and stress by reducing his time at work to part time. He tried to maintain a balance by focusing on his home tasks of keeping his household in order along with various other interests he held. To not do so would be a loss of control which he could not afford to lose. He had to keep in control. Life goes on was his formula to live by. Dr. Cheung’s talent is not only writing since his retirement from his academic career, but also in the arts. On his webpage devoted to his art, he informs the reader with a short autobiography and includes a list of his Art Exhibitions in Singapore. “I was born and brought up in Hong Kong where I studied engineering and got a 1st degree from the University of Hong Kong. I then went to England for industrial training and did research acquiring a PhD in engineering from the Imperial College, London. In 1970 I came to Singapore to be a university academic got married and took up citizenship. I continued to lecture until my retirement as Associate Professor at the Nanyang Technological University, soon after the death of my dear wife. Since retirement, I took a complete change to pursue my passion for creative visual art. I am now active as an artist, initially doing sculptures and installation art, and subsequently attracted to doing oil paintings. Whatever is the medium, the style that I like most is figurative and realism. My skills and my knowledge of these visual art media are acquired partly from the Nanyang Academy of Fine Arts, Singapore, and very much from self-learning. My artworks are a fusion of these three endeavors – my deep passion for excellence and creativity in visual art; my long-term interest in current world affairs; and my hands-on practical technical skills. My art is a combined visual expression of what I think and feel, and what I would like to communicate. An important part of what I think and feel as a human being is to make my art rest on solid reality. It should not be divorced from humanity, from human society, from our environment, and from the activities and events going on around me in the world. In communicating to viewers, I hope my art can do more than just touch their hearts. I wish it would go deeper, to reach out for their minds, to make them think. To aid in their understanding, I find it necessary to have written explanations to supplement my visual artworks. Since 2010, I regret I have to stop doing these artworks seriously due to a medical problem. Note: Dr. Cheung’s rehabilitation is lengthy because of paralysis and therapy. He returned home in June, 2014, and continues his rehab with help from his caregivers. In 2015 he has regained enough dexterity to type and be online to continue to support others. Oct 2009. Held a solo Painting Exhibition called ‘Our Changing World’, sponsored by the Ngee Ann Cultural Centre (NACC). 2005, 2006 & 2008. Took part in these three annual 3D-Art Exhibitions organised by the NACC. 2006, 2007. Took part in Singapore Sculpture Society’s 2006 Exhibition at the Esplanade, and the same society’s ‘In Phases’ Exhibition at Fort Canning Park Centre. May 2007. Held a Solo Sculpture Exhibition called ‘Our World Today’, a joint presentation with the NACC.